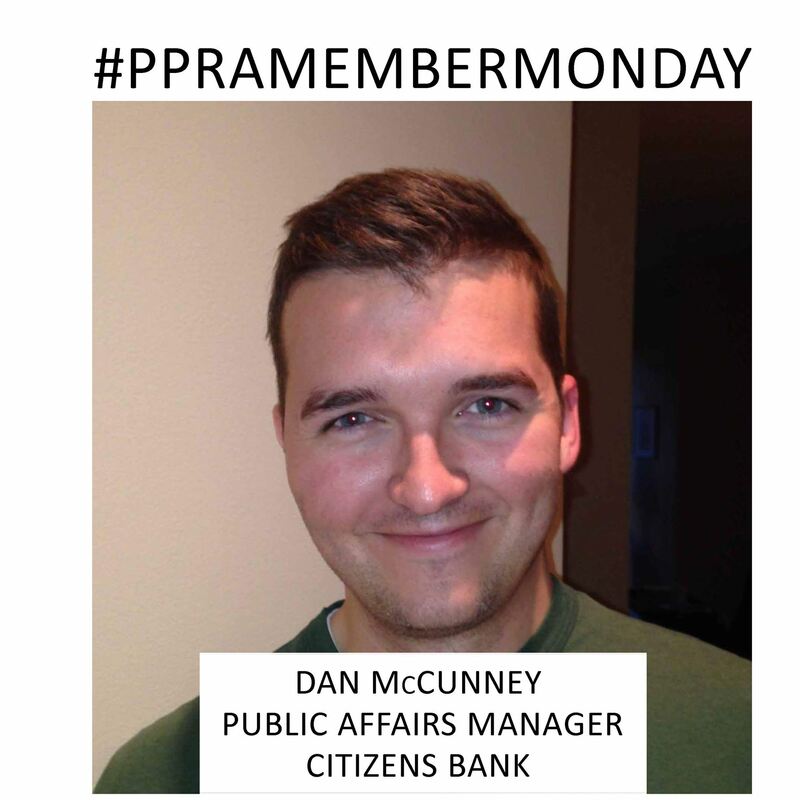 Dan McCunney is Public Affairs Manager at Citizens Bank. He has been a PPRA member for 2 years and serves on the Communications Committee. DM: I currently manage public affairs initiatives and support sponsorships for Citizens Bank in the Mid-Atlantic and Midwest regions. I came to Citizens from the nonprofit world, previously serving as the Director of Communications for the Delaware Museum of Natural History, working in Communications for the School District of Philadelphia, and prior to that working in PR for Please Touch Museum. DM: Locally, I work closely with the Phillies at Citizens Bank Park, the Mann Center for the Performing Arts, Philabundance, and many other community and nonprofit organizations. I also work with the Detroit Grand Prix, The Henry Ford Museum, the Pittsburgh Jazzfest, and Cleveland Metroparks. My territory covers six states in the Mid-Atlantic and Midwest. DM: My favorite part of the job is any time I get to participate in a check presentation or volunteer event with nonprofits in the area. There are some amazing organizations in and around Philly that are doing really special things, and I'm just glad I get to be a small part of it. Spending time at the ballpark is a pretty cool part of the job, too. DM: We just wrapped up a campaign to distribute grants that were funded almost entirely from employee contributions to the Citizens Charitable Foundation. Over 4,000 of our employees across 15 different states voted to determine which organizations to support. I was responsible for coordinating many of the communication pieces and working with our internal and external comms teams to publicize the initiative. DM: Try new things. Each job is different and you'll find things you like or dislike at any job, but don't be afraid to jump out of your comfort zone and take a shot at something new. One of my favorite jobs was working in the communications office at a nursing home and getting to spend time with people that had years and years of experience at all sorts of things, but especially at life. DM: "A Few Good Men" is one of my favorites and I can watch it any time it comes on TV. DM: I live not far from Lemon Hill in Fairmount Park so I like to walk my dog over there. It has great views of the city skyline from the backside of the art museum, the river, and Boathouse Row. DM: My favorite childhood book was "Maniac Magee" because it took place in this area and at the time I read it, I was around the same age as the main character.